I promise I didn’t forget about Bakerita, or the fact that I still have to fill you all in on my most recent travels…but for some reason, I just haven’t been able to write. I could say it was finals, or the stress/sadness of leaving England in FIVE DAYS (whaaat?! ), but really, I’ve just had writer’s block. I couldn’t come up with the words needed to encapsulate the true nature of the cities I’d visited to show them to you in a way that I wanted. So I hope you’ll forgive me, and I hope that I can do better right now. 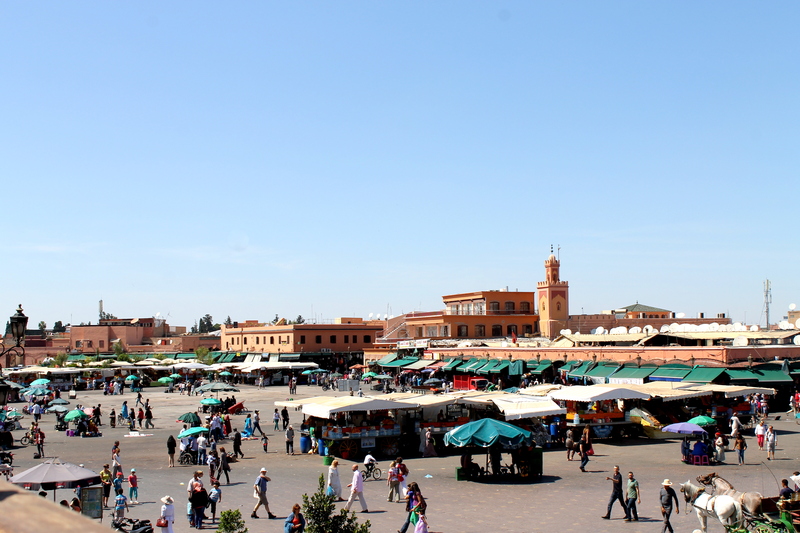 So – first up, Morocco! 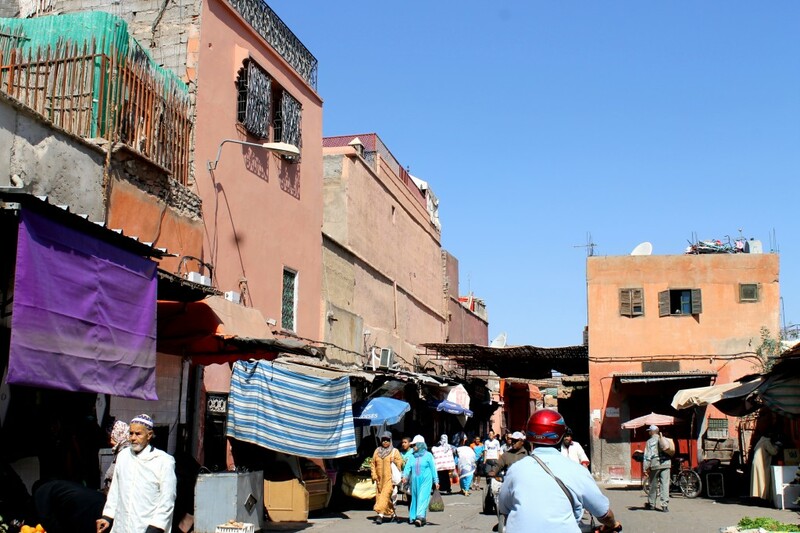 Marrakech, Morocco was without a doubt the most culturally different place that I visited on all of my European (and African) travels, and undoubtedly one of the most interesting. This was the first place in went on my jaunt from Marrakech –> Madrid –> Barcelona –> Florence, and it was so different and such a unique start to the trip. 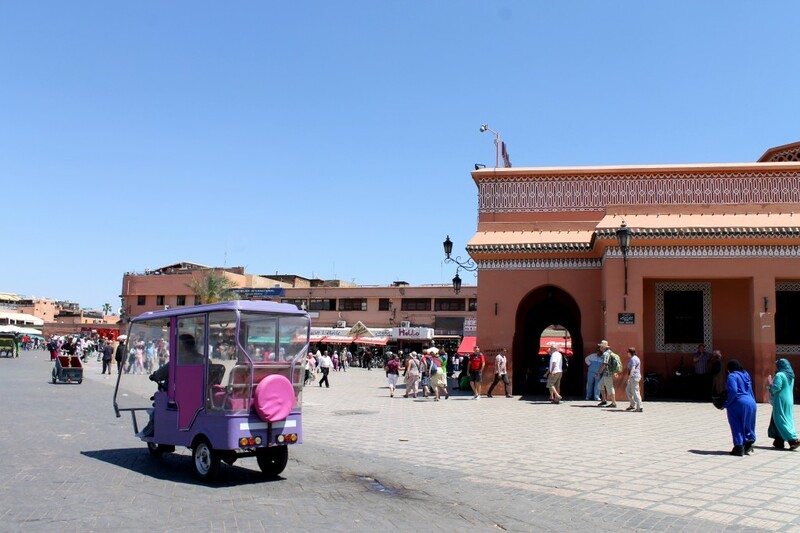 I went with my friend Paige and first piece of advice if you’re considering a Morocco trip…probably not the best idea to stay in a riad (a hostel-sort of situation) a little too far outside of the main plaza as just a pair of two, young, very clearly touristy girls. While nothing bad happened, we were constantly being catcalled (pretty vulgarly, I may add) and occasionally followed down the street. Ignoring them and ducking into alley ways to ditch our followers happened pretty frequently, but thankfully we were able to disregard it enough that we still majorly enjoyed exploring the unique and beautiful city. 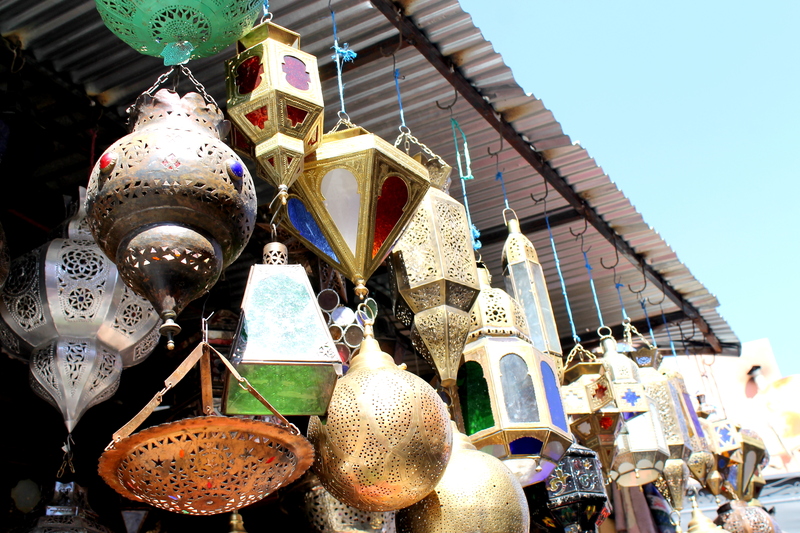 The city was an adventure, and we most definitely spent a lot of time getting lost in small alleys in the markets, admiring handmade trinkets, basking in the sun (which we had missed SO much after a London winter) and witnessing a culture that was completely different from what we knew. 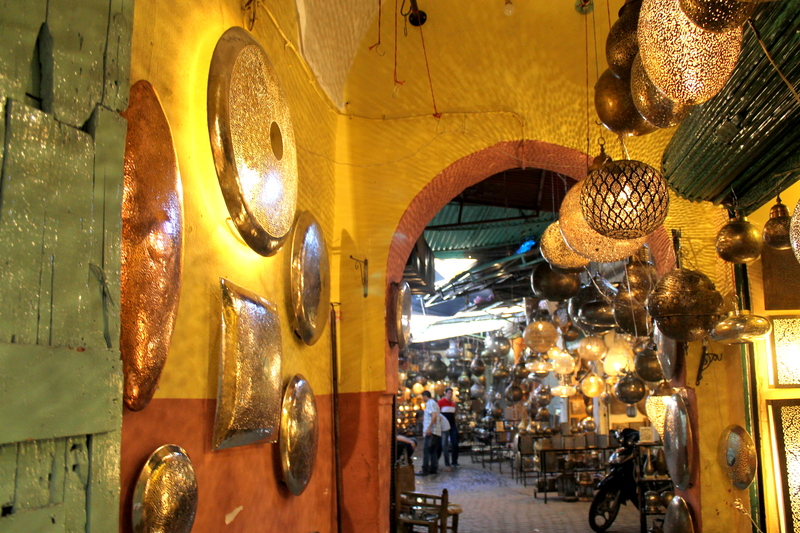 As usual…there’s a lot of pictures, as Marrakech is hard to describe in words. 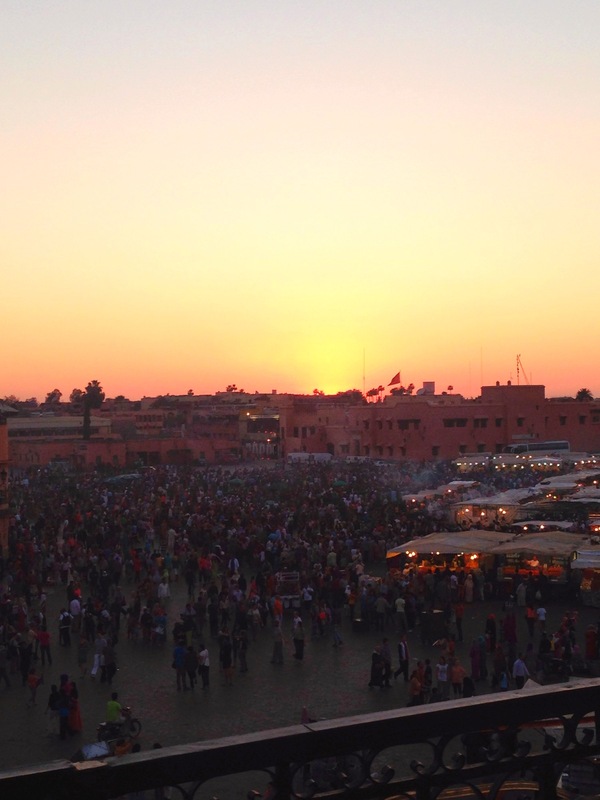 It’s a vivid, lively, and special city, and I hope I was able to capture that in my photos. 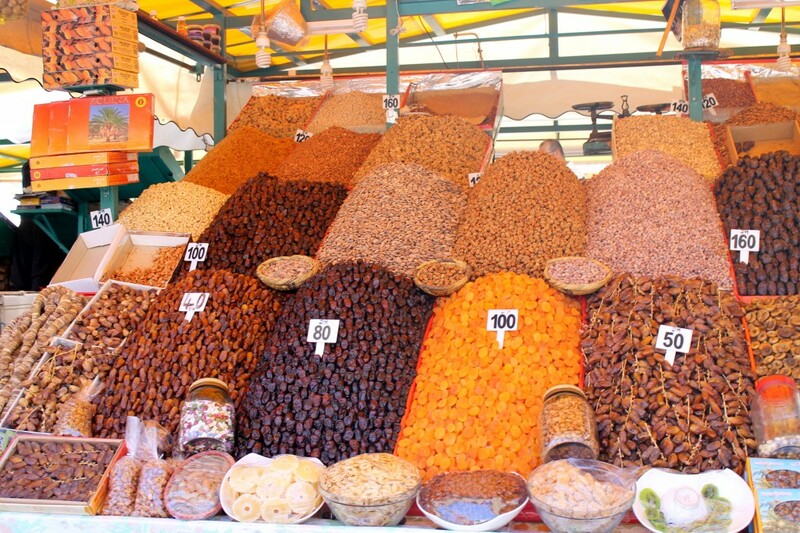 Our first morning in Marrakech, we explored the markets. We were looking for a certain cafe we had heard of, and in the midst of our search, we got incredibly lost in the markets. Streets there are rarely marked, and when they are, it’s in Arabic, and therefore totally foreign to anything Paige or I could decipher. However, getting lost was sort of a blessing. 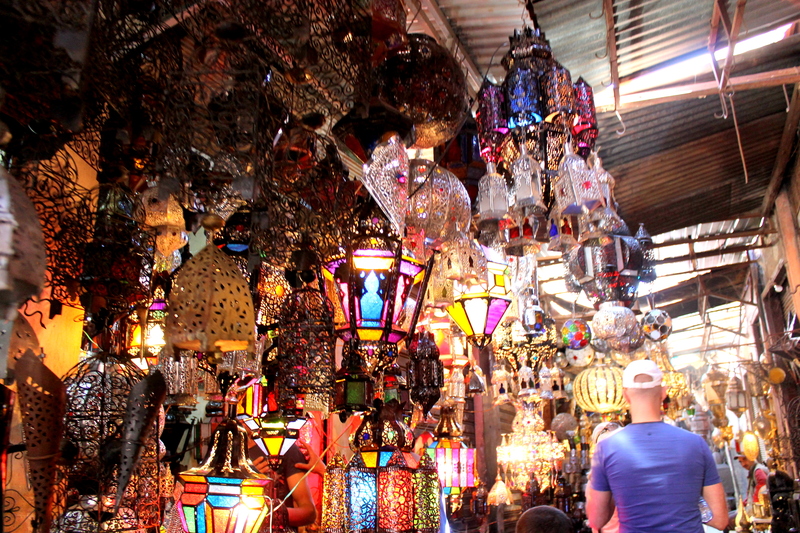 We wandered through the stalls for hours, admiring the handiwork and the brightly lit up lamps.Oh, those lamps. I was in love with all of them, and wanted to bring them all home with me. The colors were so vibrant and the way they lit up the dark alleys was incredible. The man running the shop, pictures above with Paige, pulled us in and insisted on wrapping us all up in the traditional way, and taking photos for us. 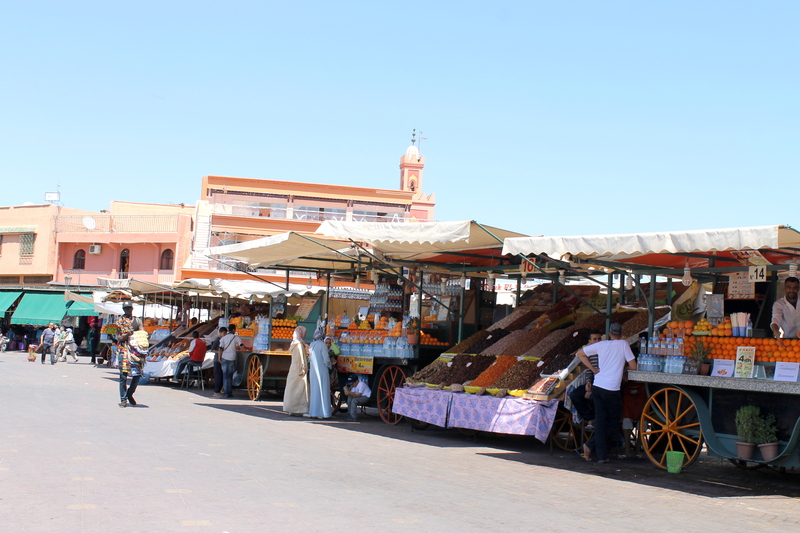 He was so sweet, and told us so much about Moroccan tradition and the garb that they wear. 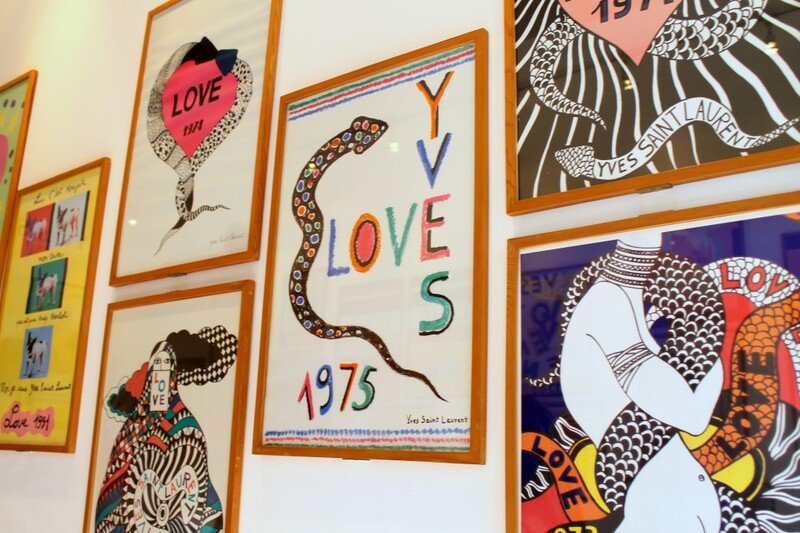 We ended up purchasing two silk scarves from him, and they’re so gorgeously made! 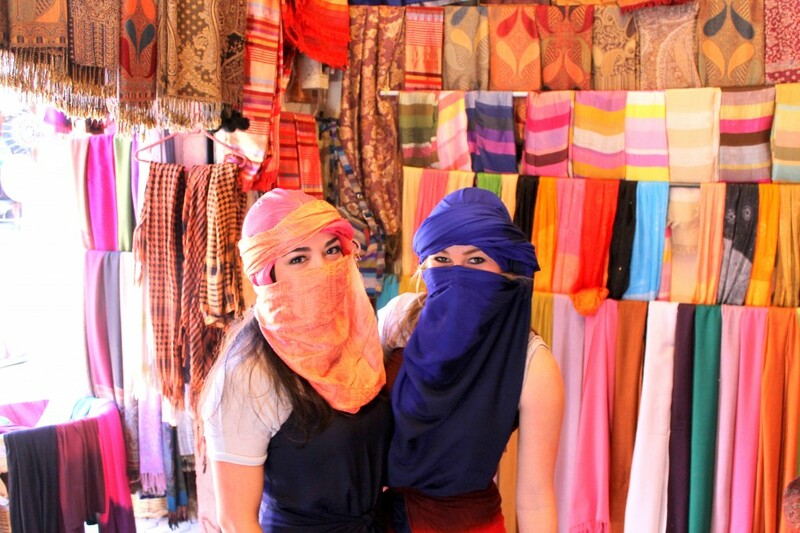 We wore them the next day on our other adventure…which you’ll see pictured in a little bit! 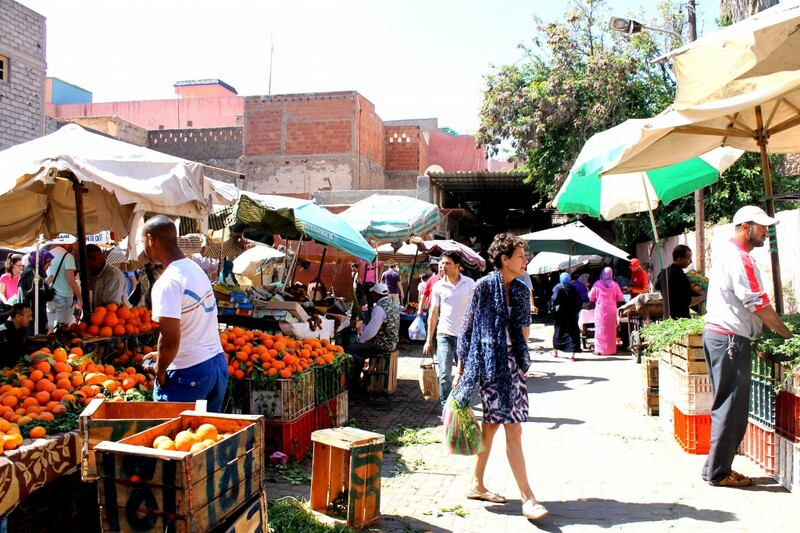 After dressing us all up, he took us through the market a bit, and showed us around. 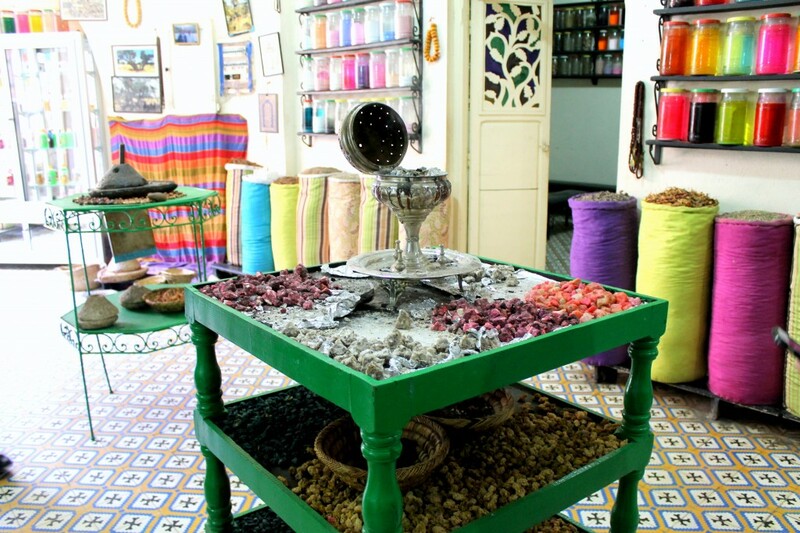 First he showed us this little shop, which was absolutely full of yarn of all colors. It was truly incredible, and I wish I had a better photo to show you just how much of it there was! 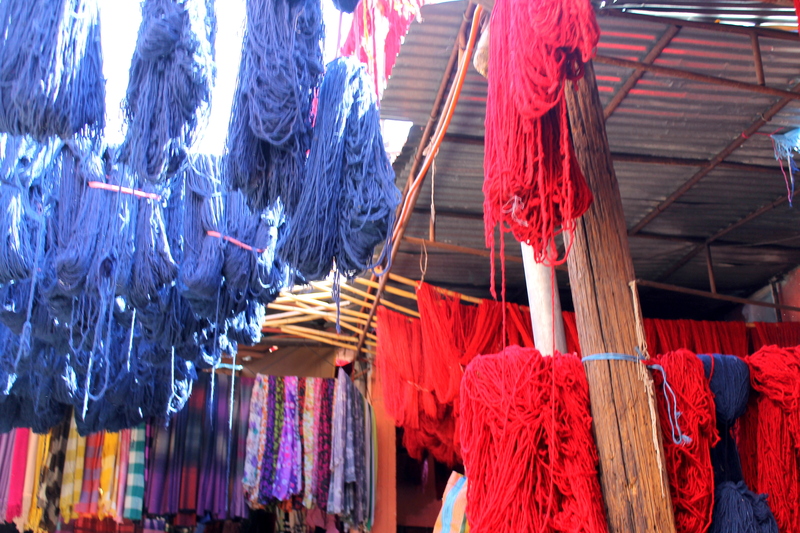 In the same shop, he showed us the dyes that they used to color the fabrics and wools. 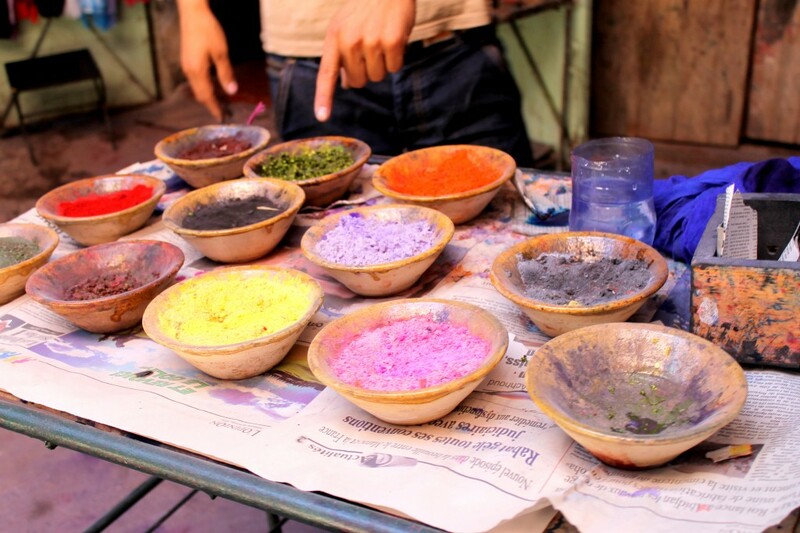 Surprise, surprise…not all the colors are representative of the colors that they dyed things! We were totally off in our guesses, but our lovely guide showed us all the cool color changes. 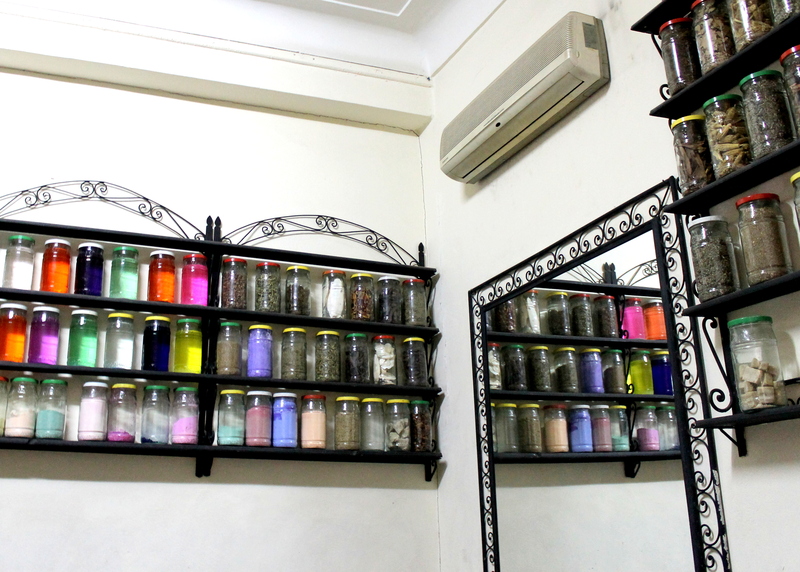 We finally ended up at our guide’s father’s pharmacy shop. From there, one of the workers showed us around the store. 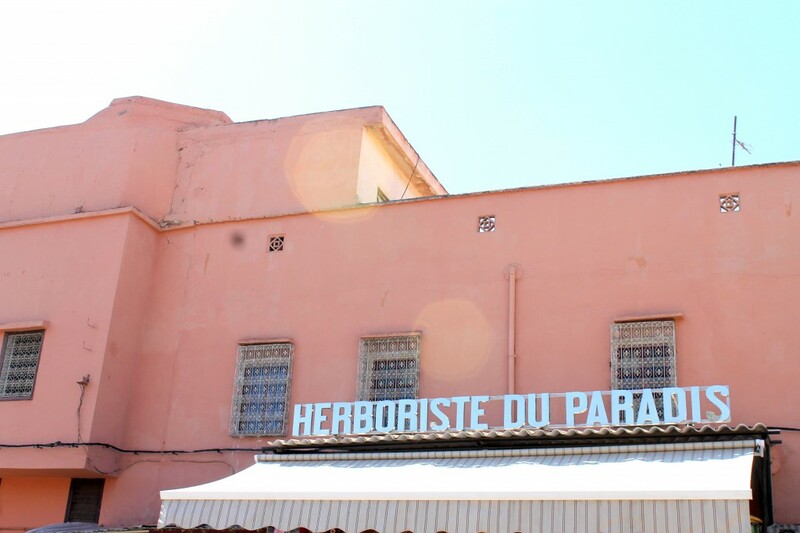 He showed us all the herbal medicines that were popular in Morocco, slathered us with some solid natural perfumes they had in the shop, and showed us the incredible amount of spices that were displayed all around the walls. As someone who loves to cook (obviously…) it was absolutely mind blowing to see the sheer amount and quantity of spices they had! 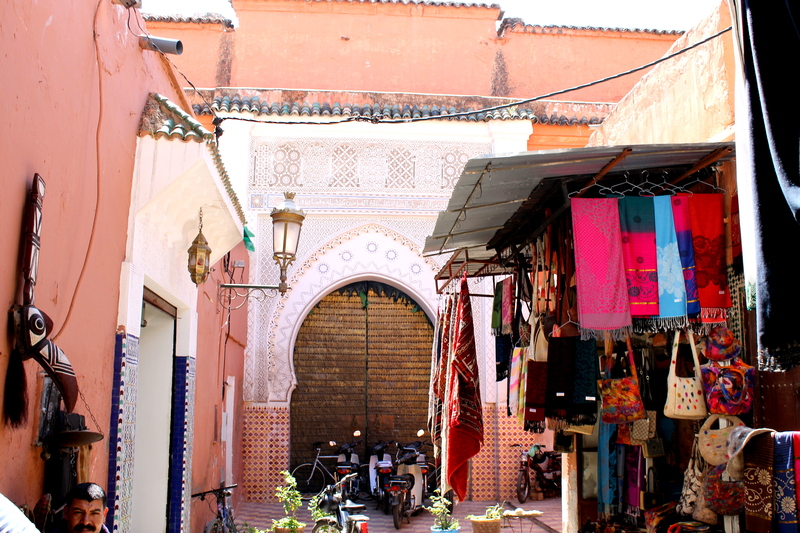 After our impromptu tour, we stopped and grabbed lunch at a little Moroccan place off one of the alleys. We decided to share and got a beef tagine, a very traditional Moroccan dish, named after the pot that it’s cooked in. 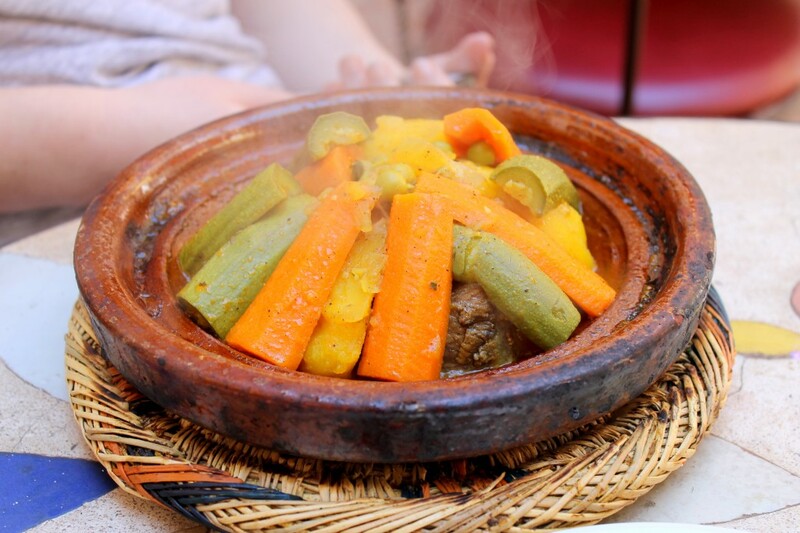 It usually entails meat that gets super tender because of the cooking method, and veggies of some sort (usually potatoes and carrots from what we experienced). This one was super tender and delicious! 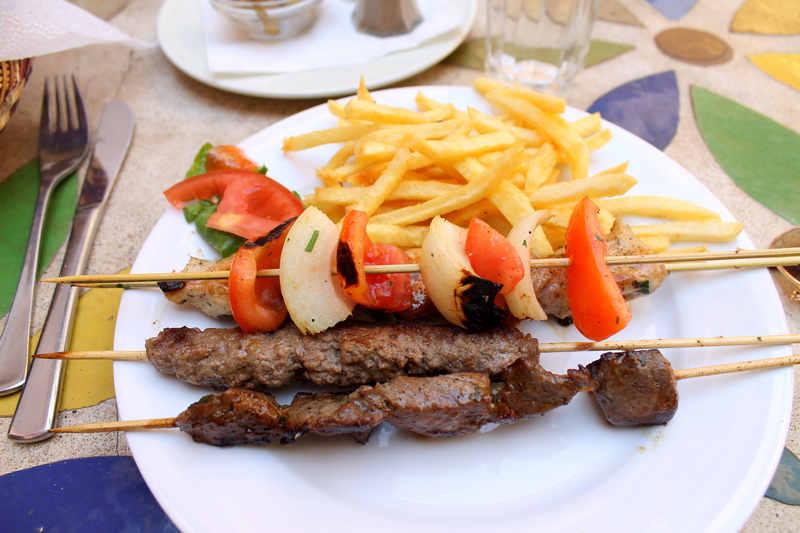 We also shared the mixed kebab platter, which was a chicken, beef, lamb, and veggie kebab served with fries! Also delicious :) we rounded off the meal with mint tea. 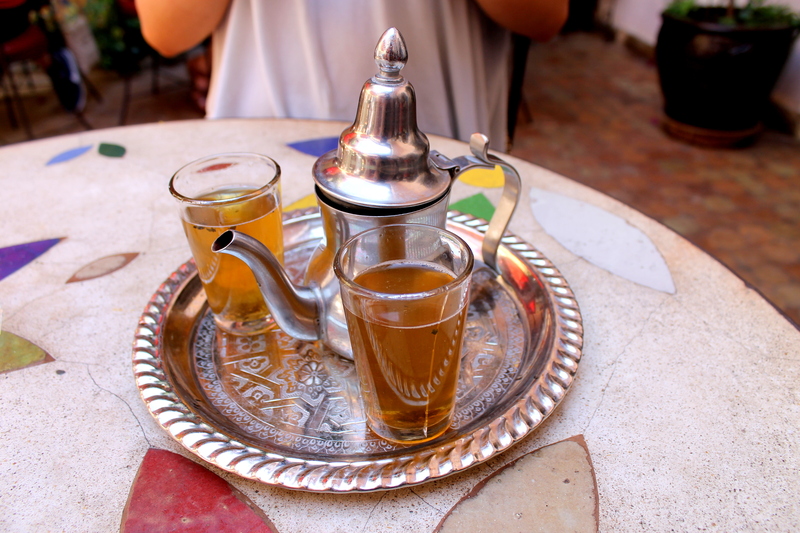 OMG – this was my first experience with Moroccan mint tea, and for the remainder of the trip, I was obsessed! It’s so darn good, even in the blistering 88 degree weather that we had.It’s sweet and minty, and I’m determined to figure out how to make it. 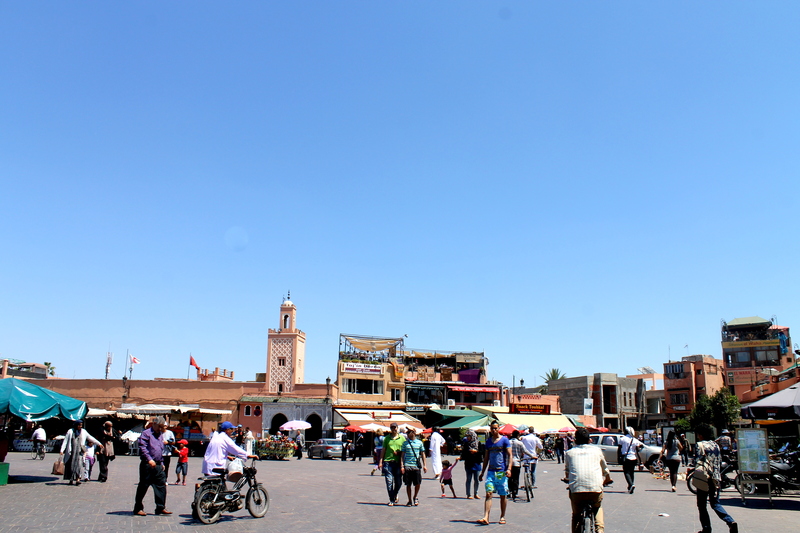 After lunch, we headed to Jemaa el-Fnaa AKA “The Big Square” where we were sort of bullied into getting henna’ed. I’m talking seriously aggressive, but it looked pretty cool, so I was okay with it! I hadn’t wanted black, but the lady didn’t give me too much of a choice. Oh well! 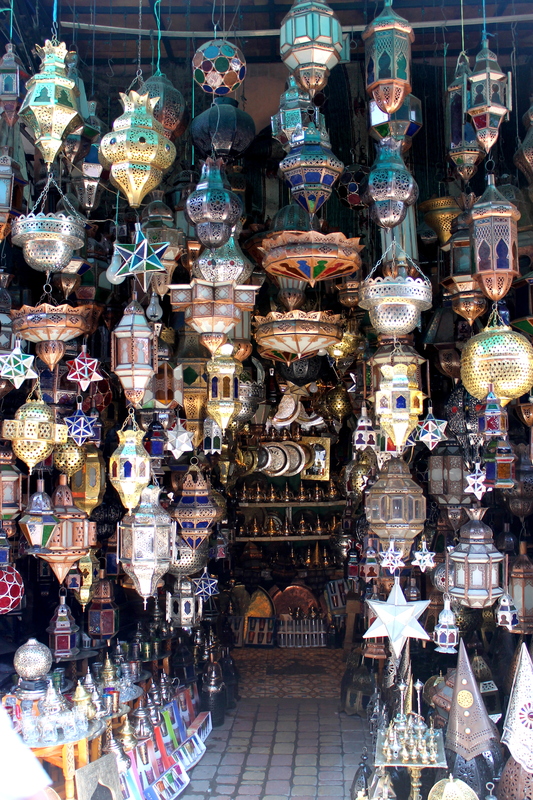 I was obsessed with this lamp store. I wish I could have like, 30 of these in my room. They were so gorgeous and so cool! 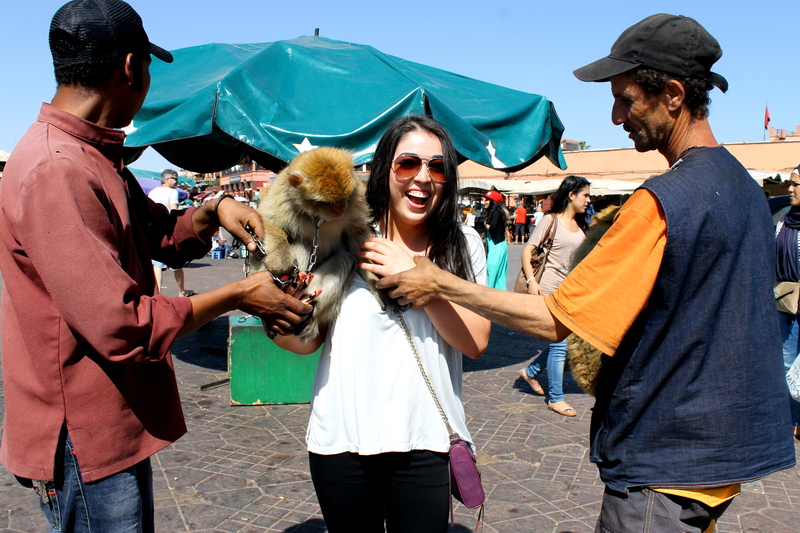 We also paid an exorbitant amount of money to play with those monkeys but they were cute, so it was (sort of) okay. Such a tourist trap, but it was a cool experience. 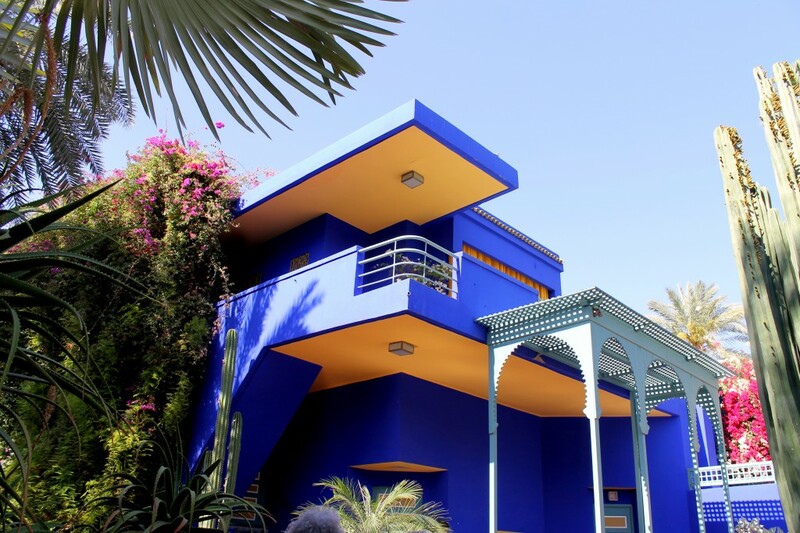 After being in the Big Square for a bit, we decided to go see Jardin Majorelle, which are the gardens in Marrakech that were designed by Yves Saint Laurent. They were so gorgeous, colorful, and cool to see! 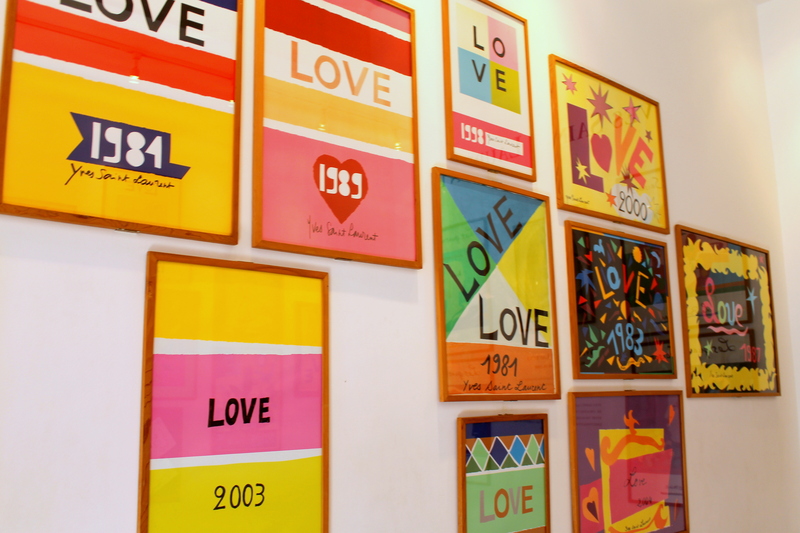 I loved the room full of “love” posters, so cool and colorful! 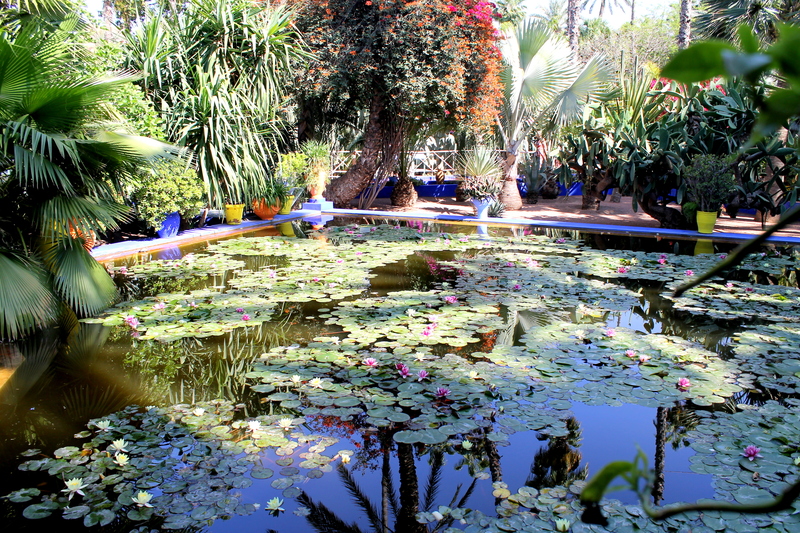 The gardens were so nice and relaxing of such a long day running around (and getting lost) in Marrakech. 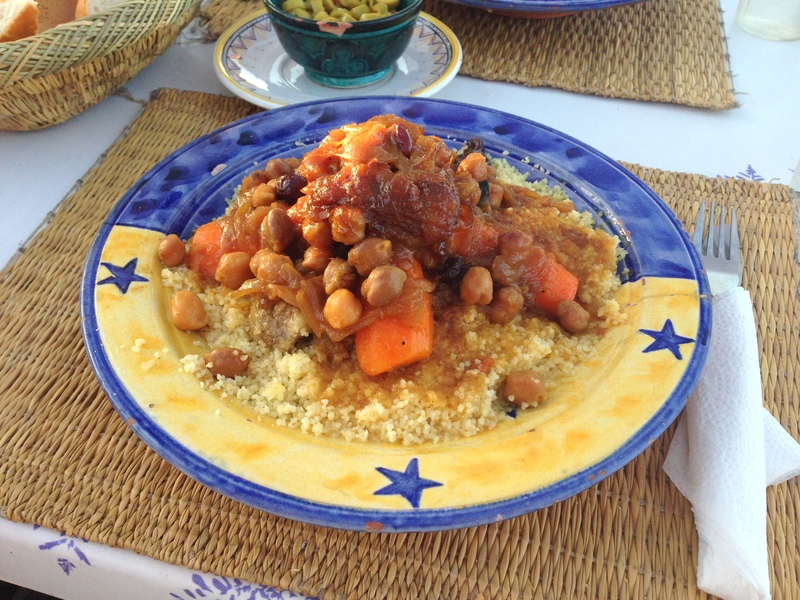 For dinner that night, we headed back into the Big Square, and wanted to get couscous, another traditional Moroccan dish. This was my dinner, which was called tfaya couscous. It was made with veal, and seasoned with raisins and cinnamon! It was so flavorful, tender, and absolutely delicious. 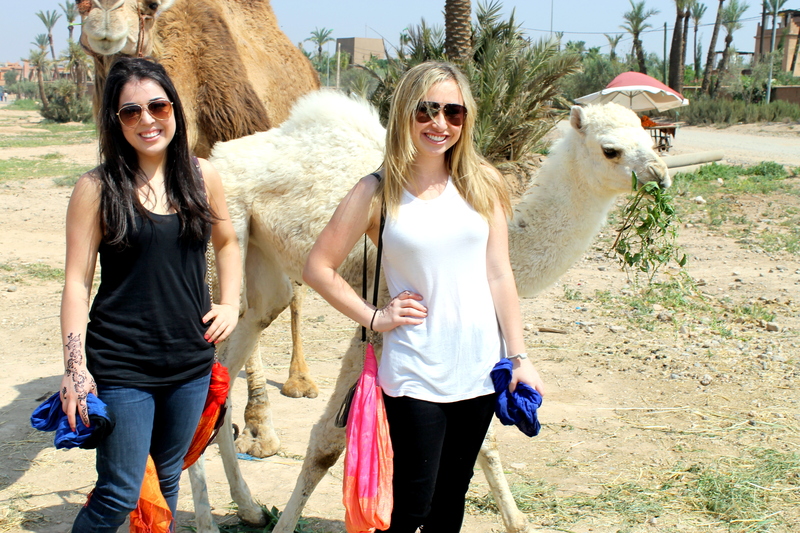 The next day, we had our camel riding adventure! 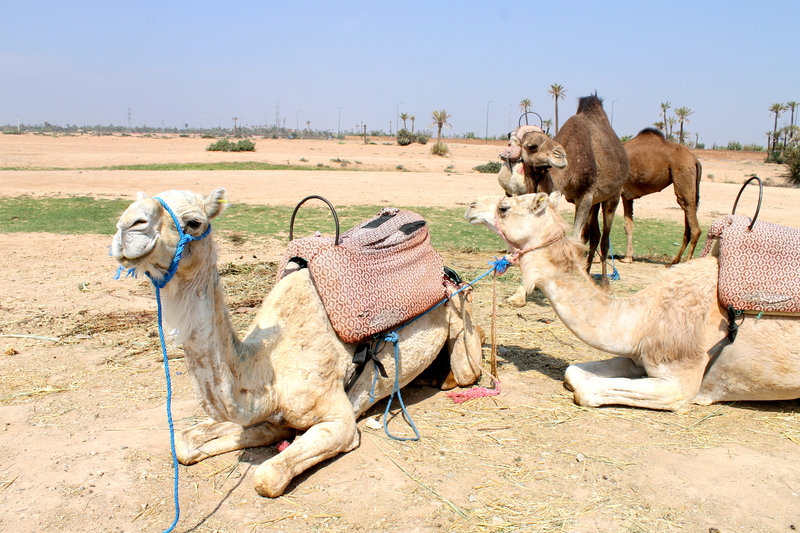 We didn’t have time to go out into the Sahara, so we went to one that was only about an hour outside of the city. It was super fun, and we had plenty of laughs. 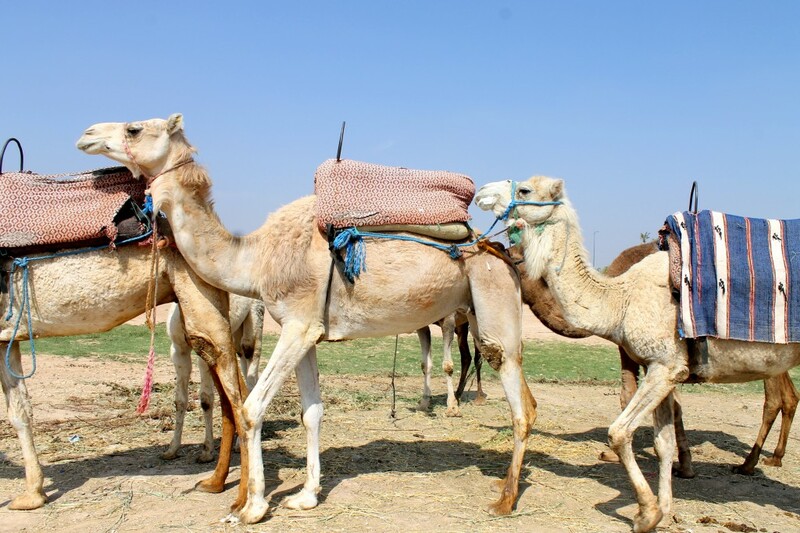 Camels are such funny animals! 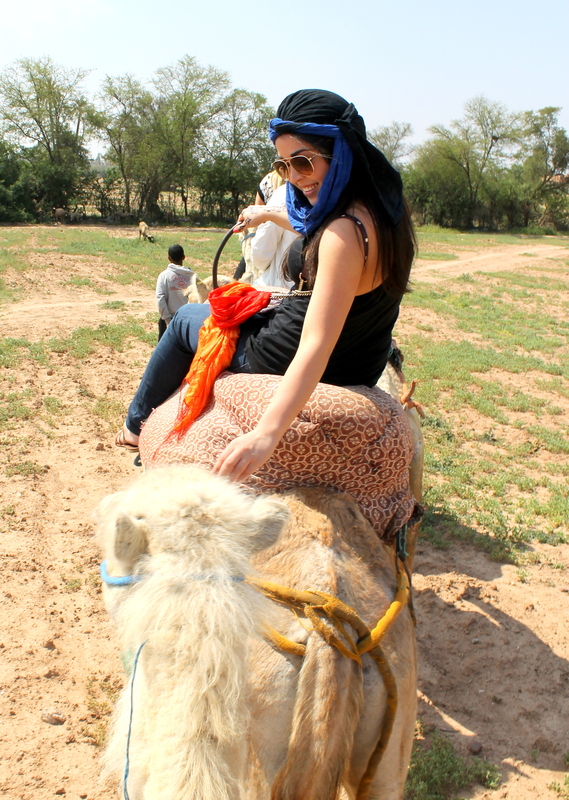 This camel loved Paige, and was getting majorly up close and personal with her! 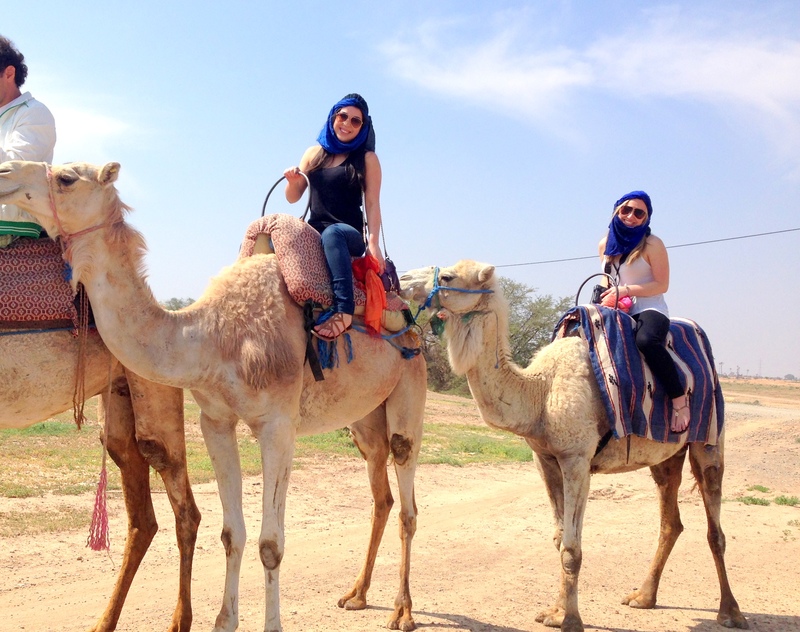 So, you wouldn’t know it from looking at this picture (right above), but this was taken seconds before that camel behind me totally headbutted me. 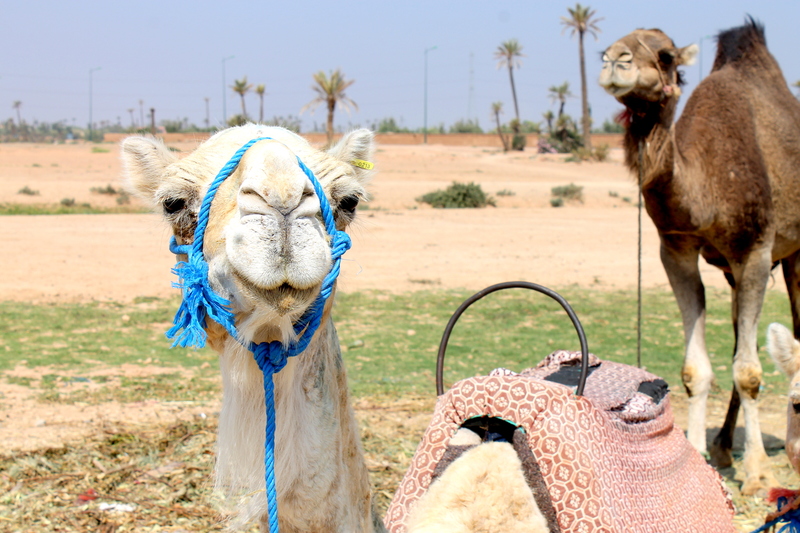 All of the guys working with the camels were staring in shock, but we were just cracking up. 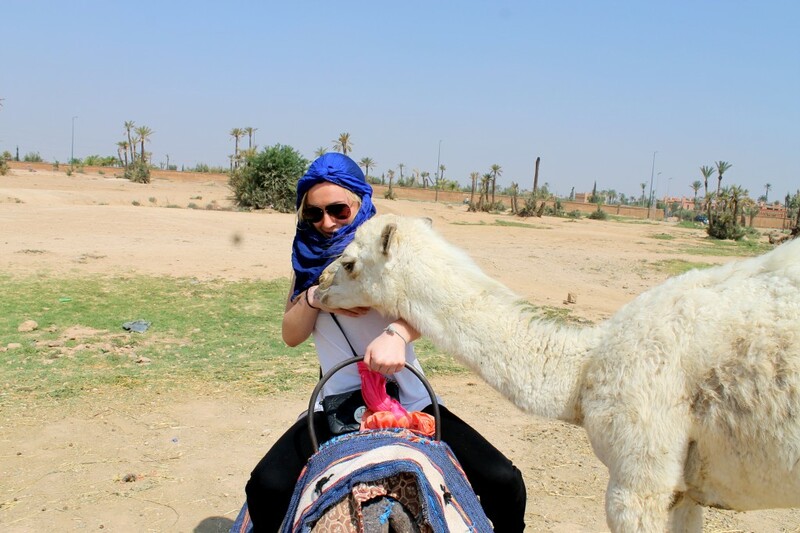 Seriously – who gets headbutted by a camel?! 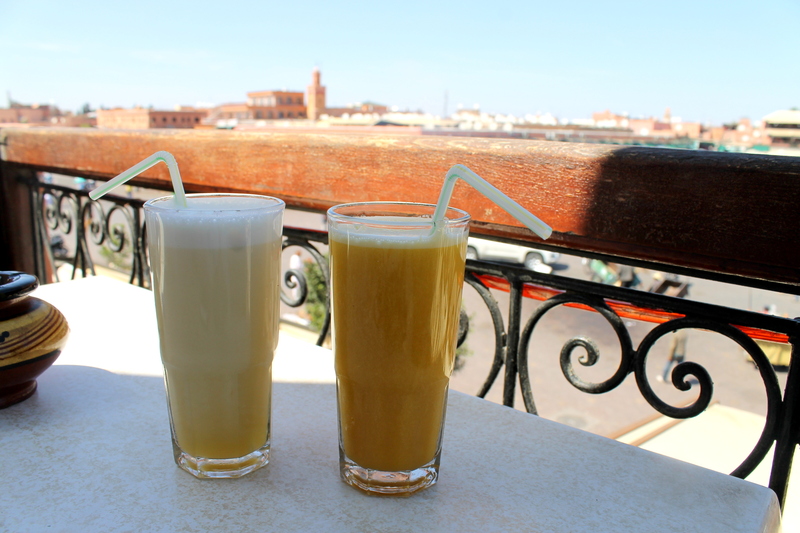 After our camel ride, we headed back into town, and we were exhausted, so we just hung out in the square for a little bit and grabbed some juices! …And that was our last day there! Our dinner was uneventful (and not photographed) so I’ll skip over that. That about wraps up the trip then! The next morning, we headed out to Madrid, which I had never been to before, and was such a cool city…but that’s for another post. 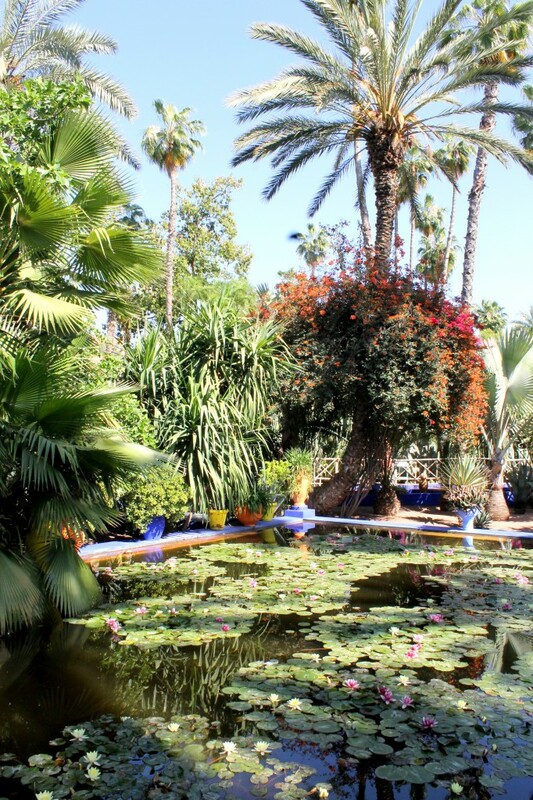 Hope you enjoyed hearing all about my Marrakech adventures! Have you ever been? Would you like to? I’d love to hear your thoughts! Amazing. Enjoyed every picture and stories behind them. Thanks for sharing your amazing adventure! omigosh so glad you’re safe!!! 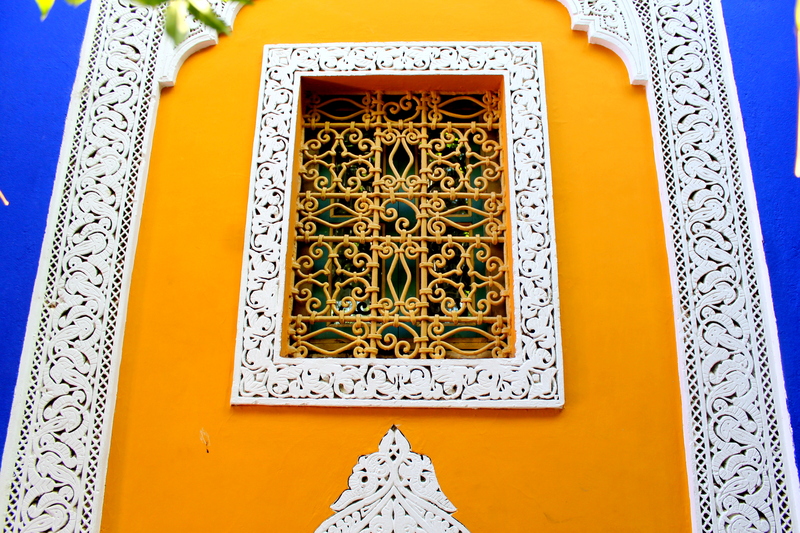 Morocco definitely looks beautiful and so unique! 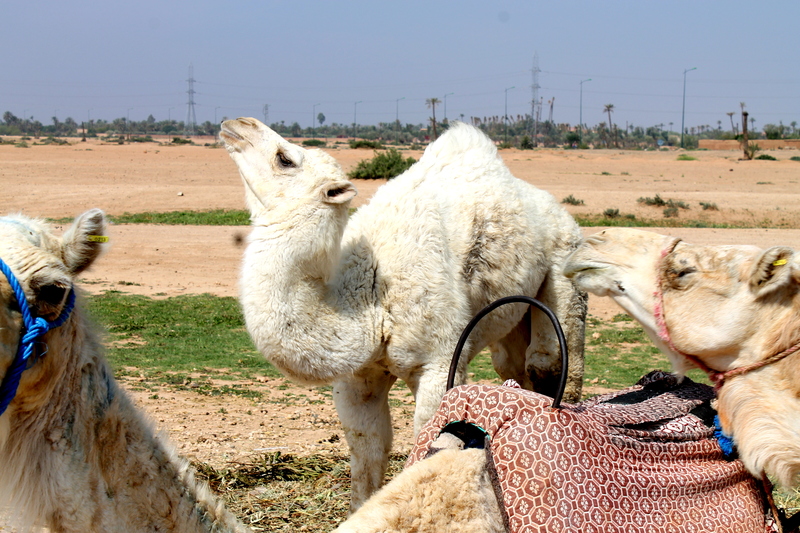 haha I kinda love that you got headbutted by a camel : ) Something that would totally happen to me. 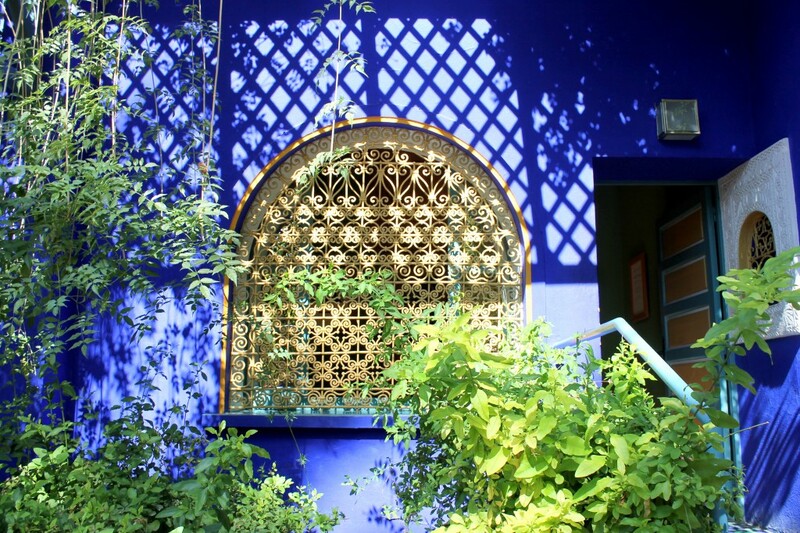 Great pictures – such pretty vibrant colors! Enjoy your last few days in England!! Soo jealous of all your travels!! 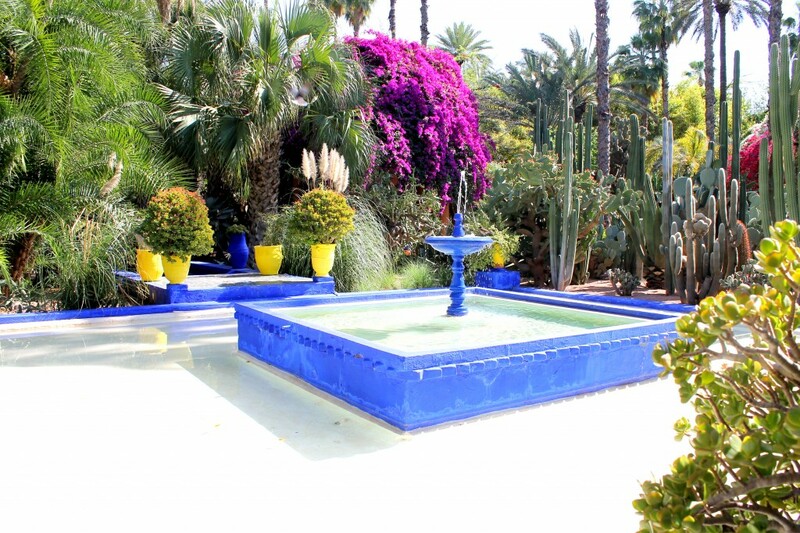 I was just looking at Morocco – looks like a beautiful and eclectic place to visit!! Rachel,Words can’t even explain how beautiful these images are! I’m from the middle east and haven’t been there in a few years and now you have me missing it so bad! Good luck on your adventures and have fun! Looks like an amazing trip! Are you in England now? I live there! Hope you had good weather! I am, but I leave tomorrow! 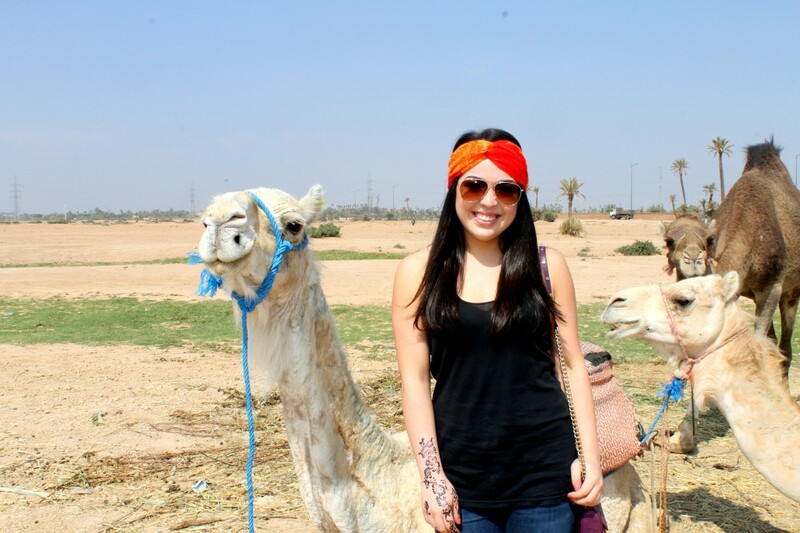 I can’t believe my time studying abroad is already over…too weird! 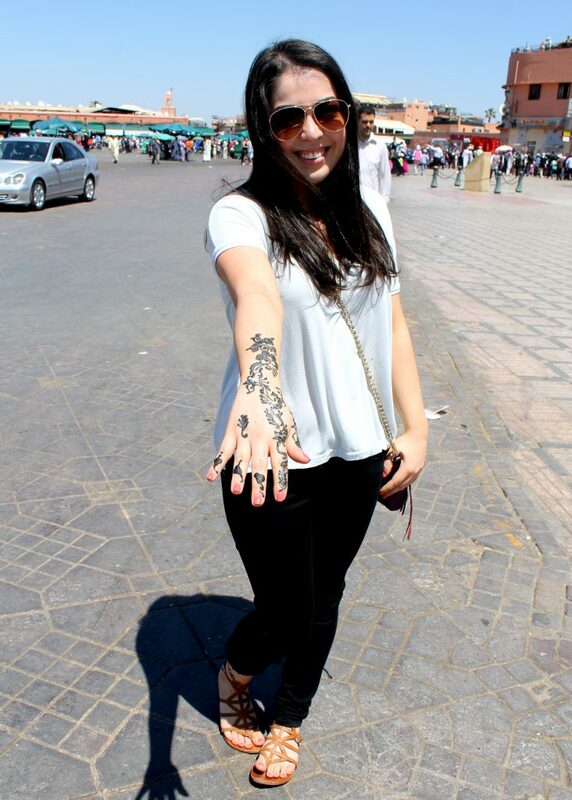 Woah, that henna looks amazing! And I’m so jealous of that monkey! This sounds like insane fun Rachel! 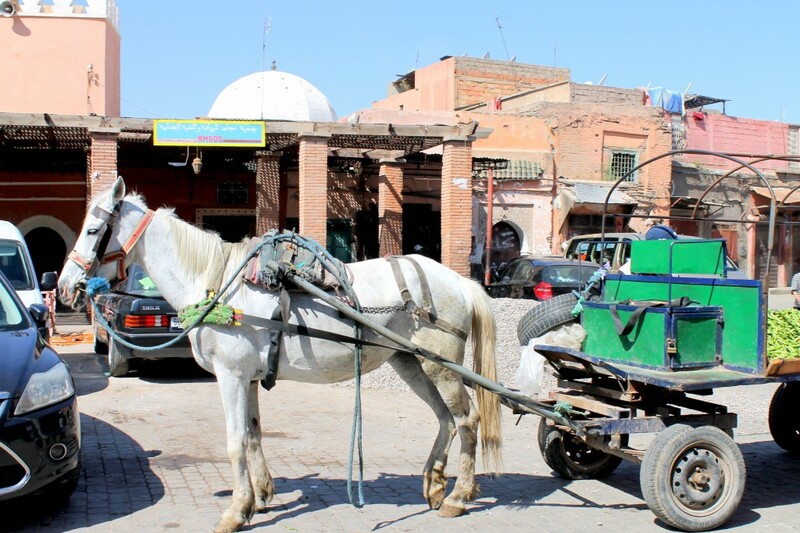 Travelling is one of my favourite things ever, and I am LOVING going through your photos from Morocco. Still laughing at the camel incident! Enjoy the rest of your trip in England! I am sooo travel jealous of you :)! So fun! !